Breda played a key role in the development of the bond between the Nassau-Orange family and the Netherlands. It is therefore fitting that we explored this castle as one of the first excursions during the Palatium Summer School. The castle came into the German Nassau family in 1403 when Engelbert I of Nassau married the only legitimate heir to John III of Polanen, Johanna van Polanen. Engelbert I thereby acquired the Barony of Breda, descendants rule the Netherlands to this day. Under Henry III of Nassau the castle would be transformed into a true Renaissance residence, though he would never see it completed. The print above gives an impression of the castle in its moat with the rich sculptural decorations, especially in the courtyard. His son Rene of Chalon completed his fathers work on the castle and added a court chapel. Rene was also the figure who was responsible for elevateing the status of the family from counts to sovereign princes through his inheritance of the Princedom of Orange in France from his uncle 1530. 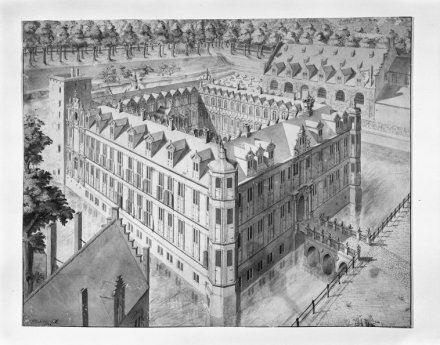 Later generations focused their attention on other residences, with The Hague as a strong focal point, although they would still occasionally lavish attention on the Castle of Breda. The great hall of the castle was used to sign the treaty of Breda, ending the second Anglo-Dutch war. This treaty also marked the exchange of the Dutch colony of New Amsterdam, better known now as New York, for Suriname. William III extended the castle and finished the transformation of the courtyard into the uniform square we see today, though used it infrequently. With its terracotta roundels, arcades, and an open colonnaded gallery on the first floor (this was soon to be closed for obvious climatological reasons) this was perhaps the earliest example in the Netherlands of a Renaissance style palace. many of the features were lost when it was converted to a military academy, the function it still has. Especially the external state staircase, the chapel and its interiors are a great loss. Some interior elements were sold, most notably a ceiling that was once used as to create a period room at Goodrich Court, though its current whereabouts are unknown. The building was extended, but also received an additional floor which meant the richly sculpted pediments that marked each bay were removed and used as landfill on the site. What remains of this once proud castle is a heavily pared down version that offers the occasional glimpse of a more glorious past. Above: One of the richly carved pediments that were recovered during archaeological excavations on the site. These would have formed an embellishment at each bay in the interior courtyard, a rather different appearance than its current austere upper storey. Above: An interesting detail on one of the remaining original stairs. This use of the classical Ionic order that shows the capitals at a 90 degree angle from how we would traditionally see them is an example of the early stage of using classical elements in the Netherlands. Above: The Stadtholder gate was one of the original entrances through the fortifications surrounding the castle. Above & Below: Funerary monument for Engelbert II of Nassau in the Grote Kerk, a rare example of Renaissance sculpture in the Netherlands. This chapel would have continued to serve the Nassau – Orange family if William of Orange hadn’t died in Delft in 1584 at a time when Breda was still in Spanish hands. The House of Orange has from that moment onwards used Delft as their last resting place.